Codonas Amusement Park is packed with rides and fun activities for both young and old. From the terrifying Looping Star to the more sedate Apple Coaster there is something for everyone. For a great view of the city our out to sea why not try the Aberdeen Eye? 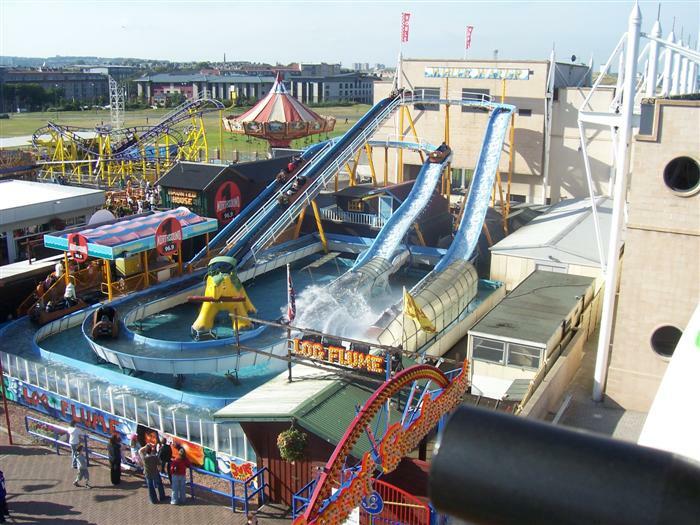 Either highlights include the dodgems, 2 mini golf courses (1 inside and 1 outside), waltzers, haunted house and the log flumes. Click on the link above for more details. 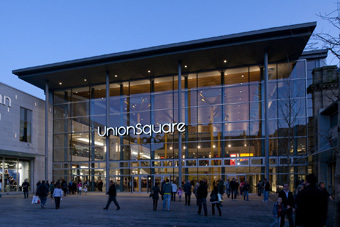 Union Square is Aberdeen’s newest shopping mall. Shops include Hollister, Super Dry, next, Apple and many, many more. There is also a multiplex cinema and a huge selection of restaurants including TGI Fridays, Nando’s, Frankie and Bennys, Pizza Hut, Yo Sushi and more. Click on the link for more details. 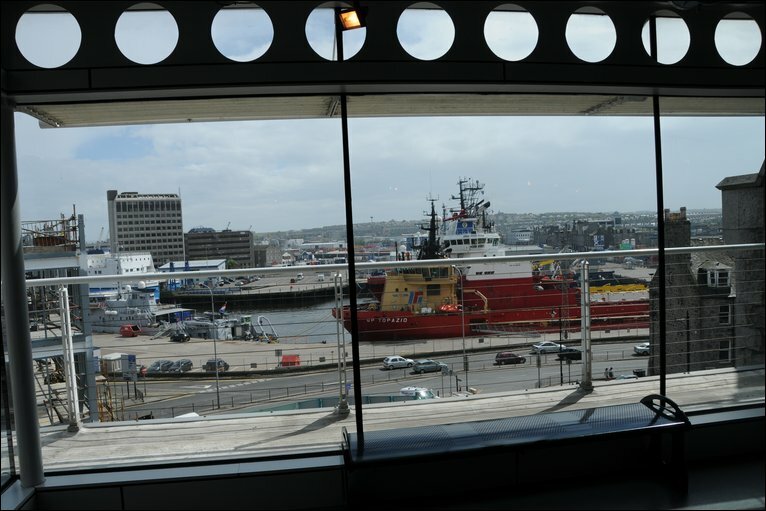 Aberdeen Maritime Museum The City’s award-winning Maritime Museum tells the captivating story of the North Sea. View exciting exhibitions and displays of the North Boats, the offshore oil industry, shipbuilding and clipper ships. The Museum also has a fascinating programme of exhibitions and displays. New exhibitions include the Aberdeen Harbour Gallery and computer interactives on Aberdeen – everything from fishing techniques to how to “park” your ship in the harbour. Admission is free. Duthie Park is a park of 44 acres which was donated to the city by Miss Duthie in 1880 and opened to the public in 1883. The park has many artefacts including a bandstand, fountains, ponds, and statues. Within the park is the Winter Gardens, which were rebuilt in 1970. These house many exotic plants including the largest collection of cacti in Britain. This is a park for all the family, with activities from boating in the ponds to cricket on the lawns. The park has cricket on the lawns, bands in the park in summer, and the ponds are to be refurbished if the City receives heritage lottery funding. There are two children’s play areas, a cafe with toilets and toilets within the Winter Gardens. 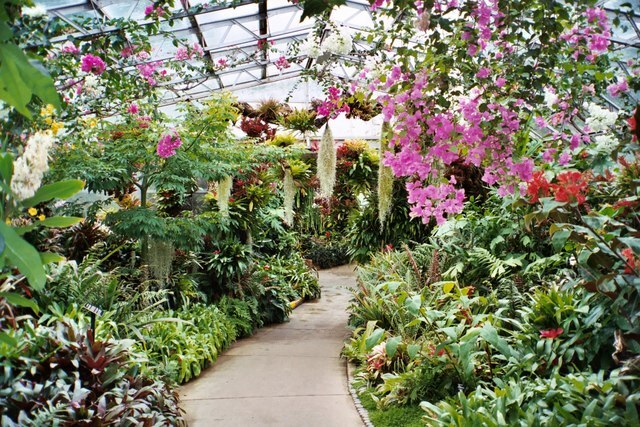 Duthie Park is also home to the David Welch Winter Gardens. Carthes Castle has fairytale-like turrets, gargoyles of fantastic design and the ancient Horn of Leys given in 1323 by Robert the Bruce are just a few of the features of this historic castle. The Crathes gardens and estate are ideal for a family day out. A delight at any time of year, the famous gardens feature great yew hedges and colourful double herbaceous borders. Further afield, the 595-acre estate offers six separate trails to enjoy. 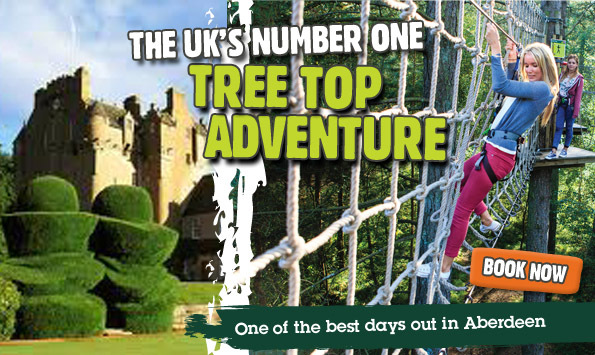 Go Ape Crathes Castle, enjoy their Epic Skateboard Zip Wire and Some Stunning Scenery near Aberdeen. A great day out if you’re looking for adventure activities near Aberdeen. 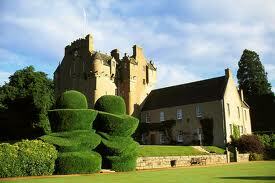 Set in the grounds of historic Crathes Castle, they are proud to unveil their new skateboard zip wires. The classic and original Go Ape adventure experience could be what your and you’re friends are after if you’re looking for things to do in Aberdeenshire. They’ll brief you for safety before you fly down zip wires, jump off Tarzan Swings and sample our fun high ropes crossings whilst enjoying some of Scotland’s most breathtaking woodland. A stones throw from Aberdeen, live life more adventurously in beautiful surroundings. Deeside Activity Park is based on Royal Deeside in the historic county of Aberdeenshire. They offer a range of outdoor and corporate team building activities and events. 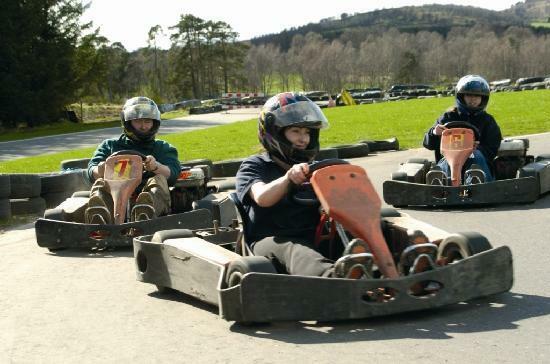 Only 45 minutes from the centre of Aberdeen they offer activities ranging from quad biking round their mud-splattered course and kart racing on their asphalt racing circuit, to hitting the bullseye on their fully automatic archery range and breaking a clay at their clay shooting facility. In addition, they also offer 4×4 offroad driving, paintball, and rifle target shooting amongst others. Check out their activities section for a full listing, they would advise giving them a call to double check availability for activities. Dunnottar Castle Visit Dunnottar Castle for an unforgettable experience. A dramatic and evocative ruined cliff top fortress in a truly stunning setting. As you wander around the extensive buildings – from the keep through the barracks, lodgings, stables and storehouses to the less-ruinous chapel and drawing room – you will discover the importance of Dunnottar, an impregnable Castle that holds many rich secrets of Scotland’s colourful past. William Wallace, Mary Queen of Scots, the Marquis of Montrose and the future King Charles II, all graced the Castle with their presence. Most famously though, it was at Dunnottar Castle that a small garrison held out against the might of Cromwell’s army for eight months and saved the Scottish Crown Jewels, the ‘Honours of Scotland’, from destruction. Crown, sceptre and sword now take pride of place in Edinburgh Castle. A darker chapter in the history of Dunnottar is that of the ‘Whig’s Vault’. The gruesome story of the imprisonment in 1685 of a group of Covenanters who refused to acknowledge the King’s supremacy in spiritual matters. The Castle was the home of the Earls Marischal once one of the most powerful families in the land. The last Earl was convicted of treason for his part in the Jacobite rising of 1715, and as a result his estates, including Dunnottar, were seized by the government. The buildings were thereafter much neglected until 1925 when the 1st Viscountess Cowdray embarked on a systematic repair of the Castle. The Castle was officially made open to visitors thereafter. Our facilities include a restaurant, a farm shop, corporate conference suite, huge indoor activities arena and 3 luxury holiday cottages. We’re open 7 days a week from 9am to 5pm, all year round. Come along to Deeside Activity Park and try the best activities that Scotland can offer and the warmest welcome in Aberdeen and the shire! 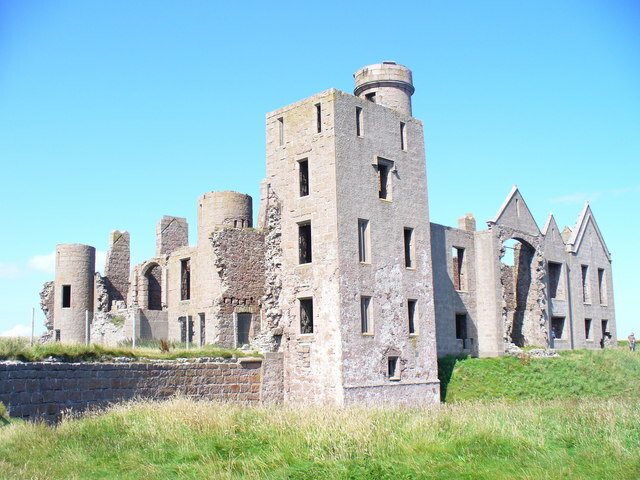 Slains Castle is found on the rocky Aberdeen coastline near the town of Cruden Bay. This atmospheric ruined castle was originally built to replace Old Slains Castle, situated about six miles south-west of the present site, after it was destroyed in 1594. New Slains Castle was erected in 1597 on the site of the former Bowness Castle. It is often said that the Slains gave Bram Stoker the inspiration for Count Dracula’s castle while staying at nearby Cruden Bay in 1895.